We are dedicated to constantly improving both our technology and user experience around search because we know that more powerful, accurate, and fast search results are critical for both buyers and sellers. With that in mind, we have just launched our new find-as-you-type search recommendation feature that's now available on every site on the SourceAudio network. Start typing in your main search field at the top of your site. Search by keyword, name, title, or any other field in your metadata. You'll notice that instantly you begin seeing recommended results that correspond to the letters you've typed in, even if your words are incomplete. To select one of the recommended results simply click on it with your mouse or use your keyboard to arrow down to the item you want to select and hit "Enter". What happens next is great; you'll bypass the standard search results page and go straight to the page for the Album, Artist, Composer, Label, or Track you selected, making searching for and finding exact matches faster and easier than ever before. You don't want to use one of the recommended results? That's fine too, just keep typing your keywords and run your search like you always have and you'll be taken to the standard search results page you're all accustomed to by now. One last thing: As always we provide the tools to turn features like this on or off so if you wish to opt out of this feature, just go into Edit Site Settings > Search and you can toggle it on or off right there. As you know we're never finished with improving the platform and its features so in the near future you'll see what we call "faceted search" become available on all sites. 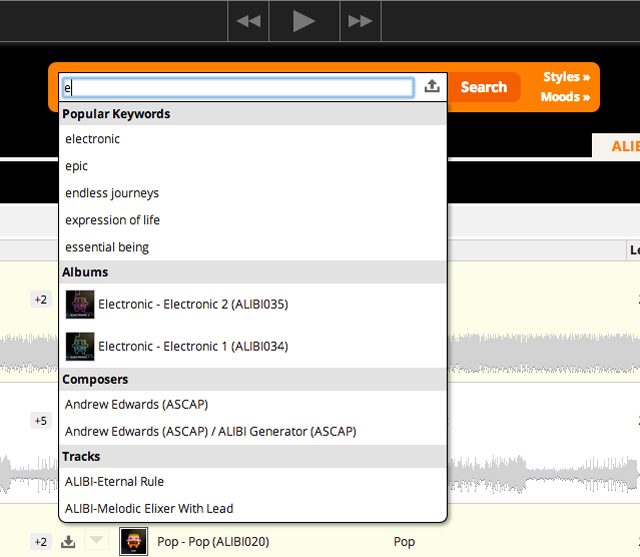 What this means in simple terms is that you'll be able to run a keyword search, see the tracks that are related to your query, but in addition to this you'll also be able to see the Albums, Labels, Artists, and Composers that are relevant and related to your search terms as well. It's a natural extension of our current search user experience and it's coming soon!